Hanoi - Sapa - Tamcoc - Halong bay - Hue - Hoian. They are all top destinations for Vietnam luxury tours. Limited offers for Vietnam tours. Length of the tour: 11 days and 10 nights. Tour Starts in: Hanoi City. pick up at the airport. Transfer to your hotel for overnight. Enjoy easy trekking in fascinating scenery to Lao Chai and Tavan villages, home to the Dzay, Black H's Mong and red Dzao minority people. Mix yourself with the stunning beauty of Tamcoc by joining a sampan rowing through three caves linked together, the highlight of your Vietnam vacation. Enjoy Welcome drink on one of the best Halong bay cruises - the new style of Vietnam luxury travel. 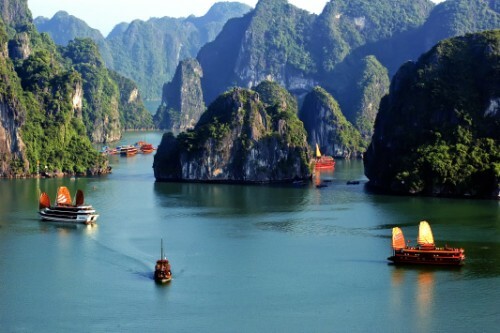 The 1st sight of Halong Bay makes you agree that it is the King of all luxury Vietnam tours. A feeling of getting lost among 3000 limestone islands of different shapes ringing one after another from seawater. Discover the floating life and surprising cave. Then, Swimming or relaxing on boat-seeing the sunset. 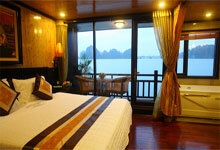 Overnight on board(Halong bay tours are the best-buy of all Vietnam luxury tours. Hue, a poetic city for your Vietnam vacation, is the capital under the Nguyen Dynasty(1802-1945) famous for its citadels, palaces, royal tombs, pagodas and temples. Visit China beach, the fascinating Cham Museum and the Marble Mountains. 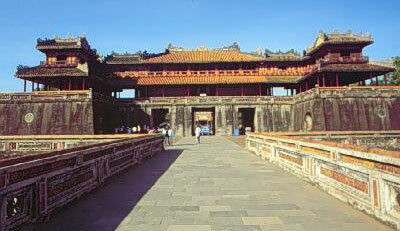 Then, drive to Hoi An, major international port in South East Asia for early Western traders. Visit the 400-year old Japanese Covered Bridge, the Phuc Kien Assembly Halls by walking through the narrow lanes lined with centuries-old houses influenced by Chinese, Japanese, French and European architectures. 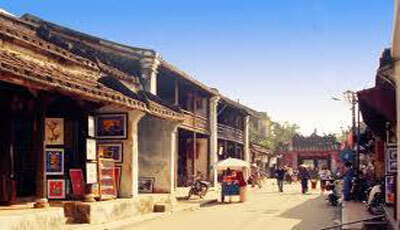 Afternoon, visit local market and take boat trip on Thu Bon River to visit handicraft villages. Overnight in Hoian(Meals: B). Free until transfer to airport for flying to Saigon or Hanoi to catch the flight home(B, -, -). Note: The price is applied until 30th Sep 2010. Many tourists chose this Vietnam package tour with 3 day Halong bay tour, the best of all Vietnam luxury tours. If you want, please contact Sale person.